Sprains occur when one or more ligaments are stretched or twisted, usually as a result of excessive force being applied to a joint that results in pain, swelling and inflammation, and loss of movement around the affected joint. The most common sprains are in the knee, ankle (sprained ankle), wrist (sprained wrist), and thumb. All it takes is a sudden twist or a momentary loss of balance resulting in a fall for the ligaments to stretch too far. 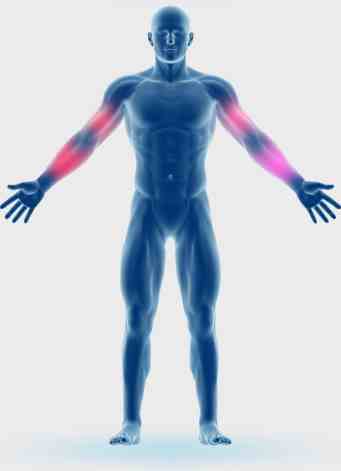 Strains occur when the muscle fibres and fascia stretch or tear, often as a result of when the muscle has been stretched beyond its limits or it has been forced to shorten too quickly. The most common types of strains affect the hamstrings that run down the back of the leg, the muscles of the calf (calf muscle strain), the quadriceps at the front of the thigh, the groin (groin strain), and the lumbar muscles in the lower back. Bruises develop when subcutaneous tissues, muscles or tendons are damaged, most often from a bump or fall. In some cases small blood vessels under the skin break or burst and blood from the capillaries leaks into the soft tissue under the skin and causes the black-and-blue color. Bruises often induce pain feeling tender or swollen.